In March 1838, Thomas Kirk sold his 100-acre farm in Licking Township - a small community on the southern border of Licking County. The farm had been my fifth great-grandfather's home since 1805 when he was among the first settlers in the Ohio wilderness. In those early years, there were few people, vast stretches of untamed landscape, and no urban developments of note: no cities and no modes of transport like highways, trains, or canals. But 33 years later all of that had changed, and Thomas moved about 23 miles northwest and settled on a 171-acre farm in Licking County's rural Monroe Township. Why? Did he long for an escape from encroaching development? The new National Road - America's first federally-funded road - was paved through Licking Township sometime between 1830 and 1833 and soon brought hordes of traffic and urbanization to Thomas' doorstep. Literally, the National Road ran along the southern boundary of his Licking Township farm. The National Park Service estimates that nearly 200,000 people used the National Road every year during its heyday in the 1830's and 1840's. "The wagons were so numerous that the leaders of one team had their noses in the trough at the end of the next wagon ahead and the coaches, drawn by four or six horses, dashed along at a speed of which a modern limited express might not feel ashamed. Besides the coaches and wagons, there were gentlemen travelling singly in the saddle, with all their luggage stuffed into their saddlebags. There were enormous droves of sheep and herds of cattle, which raised the dust like a cloud along their path." It was the 19th century equivalent of Los Angeles' 405 barreling under Thomas' nose with the Eastern Seaboard moving past his home on its way west to manifest destiny. Whether the National Road proved too much for Thomas remains uncertain. But what is now known, thanks to Engineer's Office of Licking County, is that he had been a supporter of early development efforts. 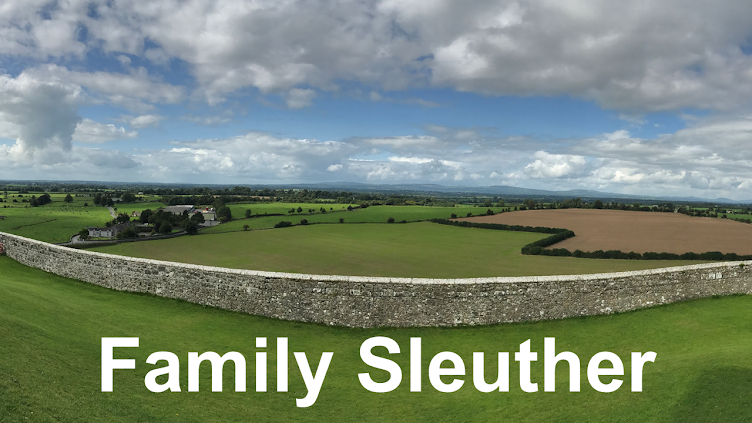 To all the genealogists out there, listen carefully! If you haven't already reached out to the Engineer's Office in the counties of your ancestors, I strongly recommend that you do so. Now! At the recommendation of the Licking County Recorder, I contacted the Engineer's Office to ask about the existence of early county maps. A single-sentence reply came back from the county's engineer himself with a hyperlink to scans of the office's historic records. The no-frills webpage that loaded was a directory grouped by categories like Atlas and Maps, Original Plats and Field Notes, Record Plats, Right-of-Way, and Surveys. I found detailed maps of Licking County and its townships that illustrate the changes of property ownership from Thomas Kirk's days up to the early 20th century. I've long toiled with following the transformation of the property boundaries over the years. That job was just made so much easier! The maps were an exciting find. If that was all the County Engineer shared with me, I would have been happy and called it a successful day. I peeked inside the Right-of-Way directory and found a sub-directory for Road Records. Within another sub-directory there more than 300 TIF files. 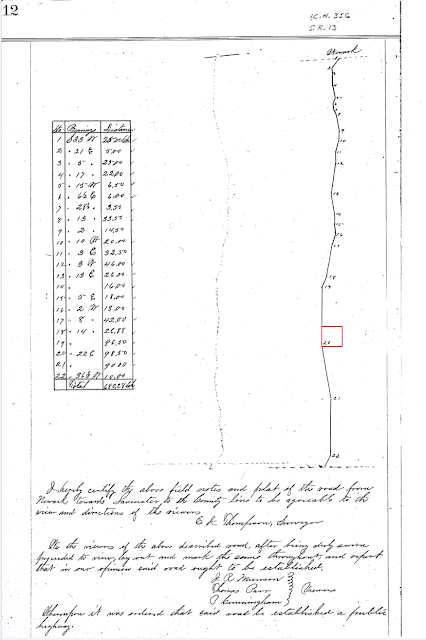 I clicked into the first record and loaded up an image of a handwritten June 1808 petition to the Licking County Board to build a road. Licking County was formed in 1808. I was looking at records that shaped the development of Thomas Kirk's hometown and driven at the request of local community members. Now, let's pause here for just a moment. My genealogical research into Thomas Kirk has long ago exceeded the bounds of a traditional reasonably exhaustive search. I have a borderline obsessive bloodthirst desire to find every record that mentions Thomas. I have to. There are very few records touching on his life that survived Licking County's 1875 courthouse fire. Advancing my Kirk genealogy could hinge on a yet-to-be-discovered piece of evidence tucked away in the most obscure corner. I've made it my business to find every.single.record that mentions Thomas Kirk. And I have now spent years surfacing every.single.record that mentions Thomas Kirk. Until this week, I didn't think there were any more records in Licking County with Thomas' name on them that I hadn't already seen. I began reviewing - page by page - the unindexed volume of petitions for roads to be built across the fledgling Licking County. "Be it remembered that on the 4th day of December 1815, Ezekiel Wells and others presented a petition for a road as follows..."
Who were the and others? Maybe my kinfolk? Maybe Thomas Kirk? Almost none of the records detailed the parties entreating the county government to build their proposed roads. Almost none. But the genealogy stars must have aligned because as I continued opening files, I came to page eleven. "Be it remembered that on the 25th day of September AD 1810 John Stadden and others presented a petition for the establishment of a road from Newark toward Lancaster, which said petition reads as follows." "To the Commissioners of Licking County O. We the undersigned citizens of Licking County, being sensible of the difficulty we are likely to labor under in consequence of the road leading from Newark to Lancaster as the sum has never been confirmed or established, and if there is money to be appropriated to the use of said road, we pray that a view and survey or such other proceedings as the Board may think for the welfare of the public as speedily as the nature of the ease will admit." Nearly all of the handwritten petitions concluded there, but this record - this beautiful record - began listing the names of the and others. My fifth great-grandfather, the man who may have moved further afield in the county to escape the hubbub that accompanied the heavily-trafficked National Road, was among the petitioners in 1810 who asked the county to build a road running south from Newark to the Licking County line towards Lancaster. John Beard was married to Margaret Kirk who I speculate was an aunt to Thomas Kirk. 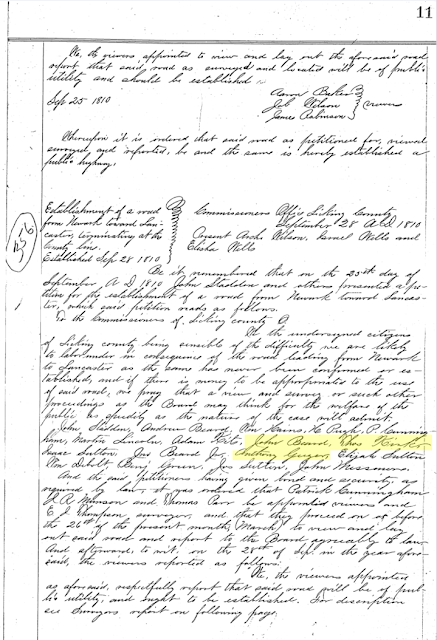 In 1812, John and Margaret sold Thomas the 100-acre farm in Licking Township that he had leased from them since 1805. Anthony Geiger was married to Mary Kirk who I speculate was a sister to Thomas Kirk. John Beard had served as Mary's surety on her wedding bond. Anthony Geiger petitioned county officials for construction of a road. 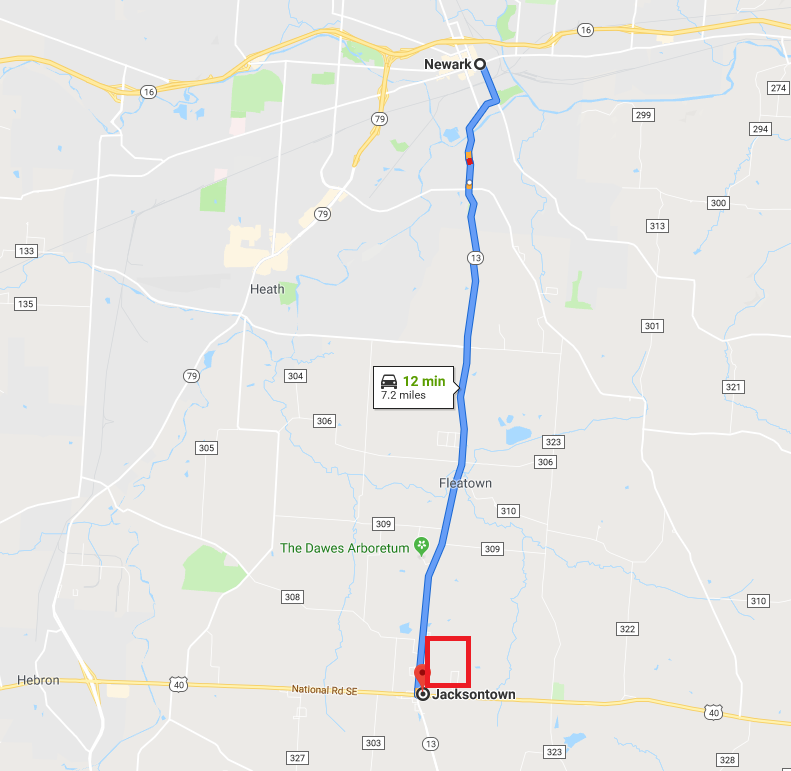 A path for the road was platted and eventually approved by the County Commissioners: "Whereupon it was ordered that said road be established a public highway." 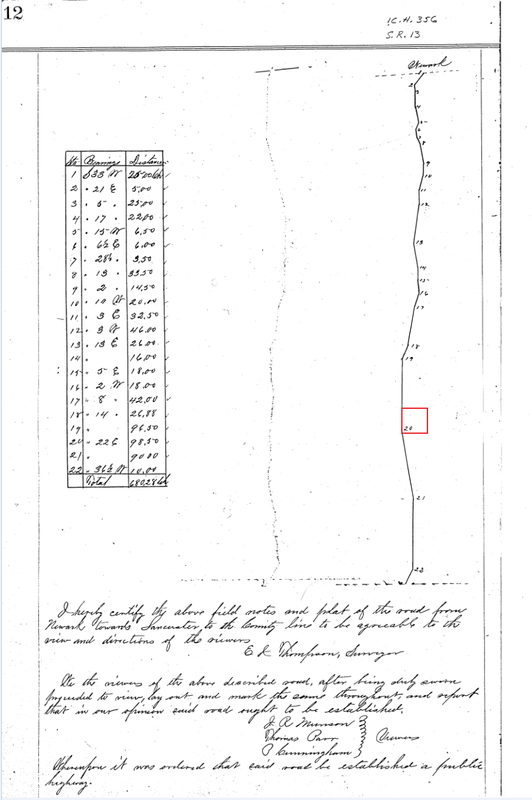 Page twelve of the digitized records included a sketch of the road. 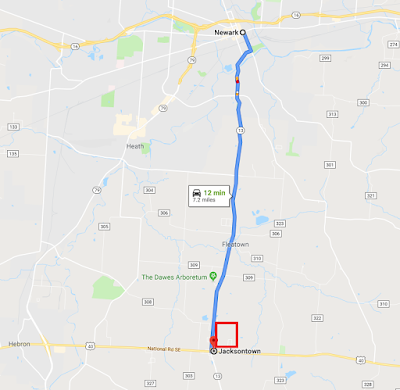 Comparing it to the area on modern Google Maps, I realized that this road still exists today and is known as the Jacksontown Road or Highway 13. The Jacksontown Road bordered Thomas Kirk's 100-acre farm along its western edge. Thomas Kirk's 100-acre farm is detailed in red. farm sat at the northeast intersection of the road with the National Road (Highway 40). The key lesson for the family historian is to be sure that you have been in touch with all county offices that may have historic records. You may be so fortunate as to discover a county engineer who has digitized the records and is willing to share them with you. Of course, this petition didn't tell me that Thomas Kirk was the son of [insert long-sought-after name here], but it did help me understand that he was an active voice in his community who sought development of his home county. That's invaluable to me because I have so little information detailing Thomas' perspectives and activities. Have you had success finding family history records with a county engineer's office? What other unconventional county offices have helped your genealogical research? Congratulations, Michael. What an amazing resource! Did you know there was such a thing as the county engineer's office before the Licking County Recorder recommended it? I had no idea. I probably walked right past the Engineer's Office on my way to the Recorder's Office and didn't give it a second glance. I'm sure glad I got the tip to reach out! I’m a follower now. Love your writing style! I’m obsessive about research and counties are treasure troves. Thanks for your post that led me to your blog and more ideas! What an incredible find, Michael! I can well imagine and appreciate your excitement! I was mighty excited. I just don't find records with Thomas Kirk anymore. It's a real rarity. So there might have been a little bit of whoopin' and hollerin'!